Basically, if you get in there early, everyone else can find you. If you come to the party late, you have to go find everyone. For me, this is a no-brainer so, Step 1 get into google plus (if you need an invite, send me a message with your email address, preferably a gmail address, and if you seem like a real person I will send you an invite). As with any social media site, this should be about you and what you can do for THEM! Make sure your bio tells them that you will be posting FABULOUS content about your industry and you are excited to be doing that. Circles are the strongest piece of the puzzle for me. They allow you to segregate your lists into pieces (I have circles for Denver Friends and Denver Realtors – I would put Denver Realtors into the little circle AND into the big general circle). There has been A LOT of talk about why having too many circles is bad, but I am convinced that this is my sweet spot. In this example, if I was doing a general marketing class in Denver I would post it to my Denver Friends circle – if it was a Realtor Marketing class, I would just post it to my Denver Realtors. BIG TIP about circles! If you don’t include the “Public” circle when you are posting things, it will look like you are not active SOOOO….make sure you use Public, Your Circles AND Extended Circles so that everyone you know, the public and people who circle your circles can see your posts. 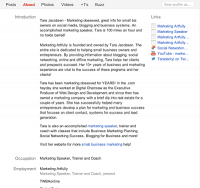 Here’s the skinny, if you are a small business owner or entrepreneur using social media marketing, I would love to see you spend a couple of minutes diving into Google Plus today! If nothing else, post a couple of things, set up your profile and add your clients (who are on already) to your circles! 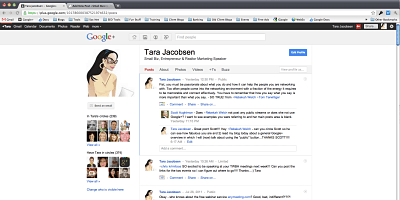 Previous Post: « Is Google Plus A Facebook Killer? Great article. Time to go work on improving my bio and making sure my posts are going to public circles. Thanks for sharing these simple tips. Yes, and business owners don’t need to make every post “public”, just some, or occasional ones. Especially make sure you post thoughts, ideas, etc. that are things you want search engines to find. If it’s not “public”, then it won’t be indexed and show up as a search result.